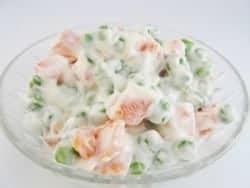 Frozen peas make up a wonderful salad, best of all this salad should be made ahead of time so the flavors can marinate. This recipe was sent in by a fellow viewer. Watch out this does make a large amount. You can make Knotts Berry Farm Pea Salad just like they used to make. This tastes even better the 2nd day! This was wonderful! My friends at church loved it. They all wanted the recipe!